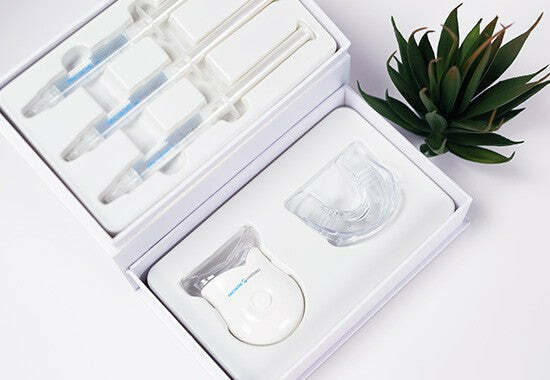 Our Teeth Whitening Kit has been designed to whiten your teeth in the comfort of your own home. Our whitening process is formulated to deliver maximum results in 6 applications with each application only taking 5 minutes. Our key ingredients ensure that there's no pain or sensitivity during the application process and the results are teeth up to 12 shades whiter! For best results, use for 6 days consecutively for only 5 minutes during each application. We recommend once a week maintenance after initial results. Our whitening gel is formulated to remove both inner and outer staining of the teeth, causing zero damage to the enamel. All of our products strictly abide by ADA and FDA rules and regulations. Implementation of a 6-bulb LED light exclusive to Smile Supply Co. helps the whitening gel break down bleaching radicals even quicker. The light is designed to optimize all of the gel's whitening effects. This is what makes our application time so fast and effective, delivering results in only 5 minutes. Our gel formula gently coats your teeth, creating a protective barrier to prevent the recurrence of stains from coffee, food coloring, tobacco and just about any other staining you can imagine. We are confident that you will have perfect, white teeth! If you don't, send your kit back within 30 days for 100% of your money back, guaranteed! We are confident that you will have perfect white teeth! If you don’t, send it back within 30 days for 100% money back guaranteed! Our innovative whitening kit can help you achieve teeth that are up to 12 shades whiter in just 6 applications! We recommend once a week maintenance after initial results. Our gel is formulated to gently whiten inner and outer stains on the teeth, causing ZERO damage to the enamel. With the addition of our 6-bulb LED Light, the gel breaks down its bleaching radicals even quicker. The light is designed to optimize all of the gel's whitening effects. Our gel formula gently coats each tooth, creating a protective barrier to prevent the recurrence of stains from coffee, food coloring, tobacco and just about any other staining you can imagine!